Choose Lube City’s ® CAA Battery Service to install your next battery and you’ll be choosing a high quality product manufactured using green practices with minimal impact to the environment. Plus, we’ll safely recycle your old battery. CAA Green Power Batteries are backed by a 6 year total warranty including 3 years free replacement and 3 years prorated guarantee. 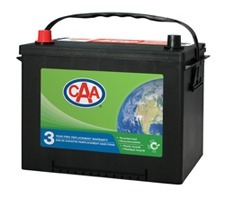 Battery Service is a CAA authorized service, so you will receive the same high quality and commitment to member service that CAA has been providing to motorists for over 100 years. Battery Service provides batteries that are best suited to your vehicle type, and come with a 72 month warranty. We want to be your #1 choice for car battery replacement service! Find a location near you!